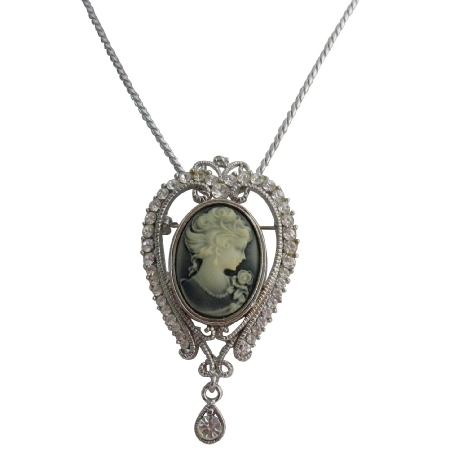 Beautiful Victorian Vintage Inspired Grey Cameo Pendant. The pendant is circled by antique metalwork, rose crystals and has teardrop glass rhinestones. The chain is made of high quality rhodium plated chain. Perfect valentine or mother's day gift. Material Used : Silver Casting Crown Framed Brooch Pendant surrounded with small clear crystals inside Gray cameo holding flower. This item in Traditional Necklace Sets category was first added to our catalog on 04-13-2014. Buy Gray Crown Queen Cameo Pendant Rhodium Plated Chain, sold & shipped by Fashion Jewelry For Everyone where you can shop online for Leading Online Retailer for Indian Fashion Jewelry. This Necklace Sets collection has been tagged as cameo jewelry, victorian necklace, prom ornaments, birthday gift, romantic gift.